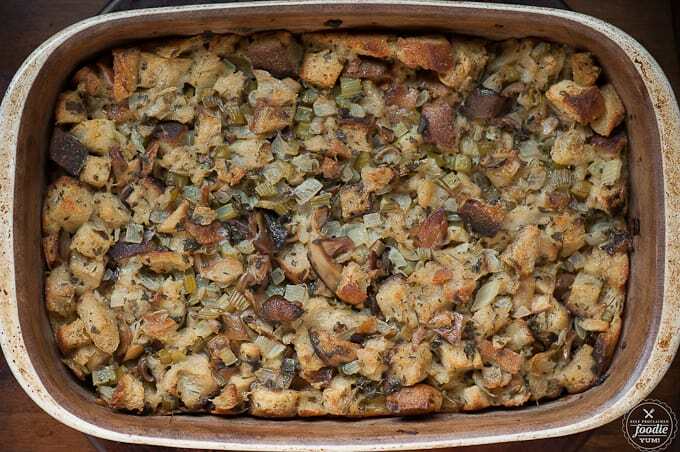 Thanksgiving wouldn’t be complete without my favorite side dish: moist and flavorful Wild Mushroom Stuffing made with rosemary bread. Confession: this was the first time I made stuffing. Or, as some people would like to refer to it, dressing (because it was never stuffed inside a bird). I’ve always used a box. Guilty. But I have a food blog now. 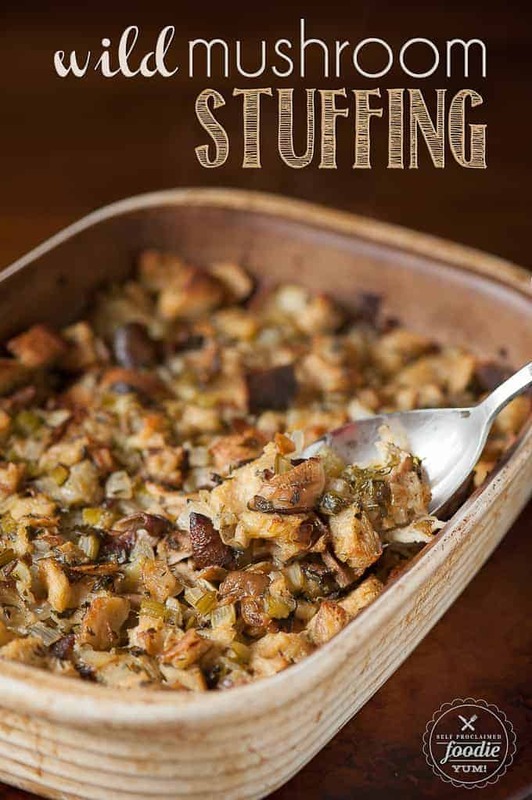 I can’t very well write about how I made boxed stuffing according to the directions on the box, now can I? 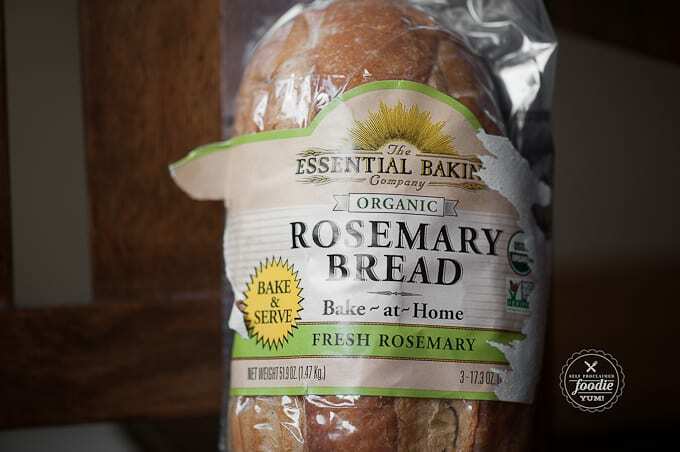 I started with this bake and serve rosemary loaf of bread. Shoot me – I didn’t make the bread from scratch. I’m a busy girl! I love using bake and serve breads in things like this and make ahead baked french toast. It’s perfectly crispy and chewy all at the same time. None of this wait a couple days for the bread to get stale business. If you’re wondering, our Costco sells this bread and I always have at least one loaf in my freezer. When I was thinking about how else I could make this stuffing awesome, I thought long and hard about the foods I love and what would taste marvelous with the sauteed onion and celery and obscene just the right amount of butter. Then it came to me – wild mushrooms. You can find wild mushrooms dried at the grocery store. Why I had never purchased these wonderful things before is beyond me. This stuffing was by far the best stuffing I have ever had in my life. Shoot. I’m doing it again. I’m writing when I’m hungry. 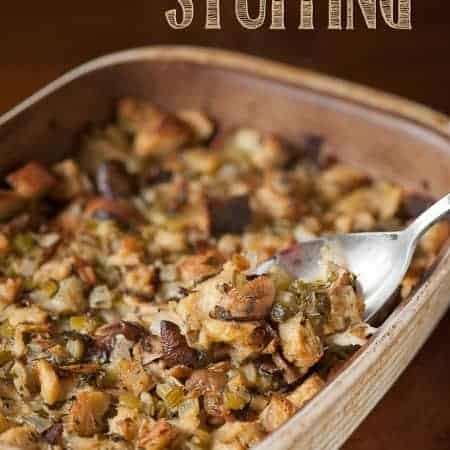 Stuffing is my most favorite Thanksgiving side dish and I’m torturing myself right now by looking at these photos and telling you how wonderful this is. 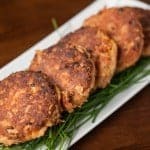 Serve this amazing stuffing alongside some damn good roast turkey, savory herb gravy, roasted garlic mashed potatoes, sweet potato casserole, green bean casserole, fresh cranberry sauce, and homemade dinner rolls for an unbelievable Thanksgiving dinner. 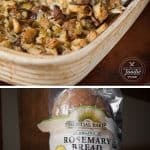 Thanksgiving wouldn't be complete without my favorite side dish: moist and flavorful Wild Mushroom Stuffing made with rosemary bread. Rinse dried mushrooms and allow to soak and rehydrate in 3 cups turkey or chicken broth. Melt 1 stick butter in a large skillet over medium high heat. Add onion, celery, and minced herbs (not the parsley). Stir to coat in the melted butter and then saute until they start to turn golden brown, about 5 minutes. Add dehydrated mushrooms and broth to skillet and bring to a simmer. Remove from heat and set aside. Allow to cool enough that mixture is cool to the touch. Meanwhile, beat egg with 1/4 cup chopped parsley in a large bowl; add cubed bread and toss to coat. Pour the cooled vegetable and broth mixture over the bread and toss. Transfer to a buttered baking dish and dot with remaining two tablespoons of butter. Cover and bake 30 minutes at 375 degrees F; uncover and bake until golden, 30 more minutes. 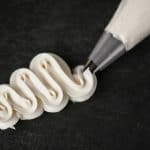 As a fellow blogger, can I say that your style of writing in this post is so authentic and and amazing? This stuffing is the best. I make a vegan version of it using olive oil instead of butter in case you have other vegan readers. My husband is NOT a vegan and he can’t get enough of it. Thank you for a great recipe! Could this be made with fresh wild mushrooms? If so, how much would you recommend? Absolutely! I might do the same this Thanksgiving. The quantity would just be a matter of preference. I could see myself adding 8-16 ounces. 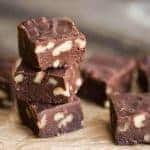 I want to make this and was gifted some dried morel mushrooms but can’t figure out how much to use! Using conversion calculations I think I’m to use about 2 tablespoons—before reconstituting.. any help would be appreciated! That sounds about right. They pack a lot of flavor so you don’t need a ton. Let me know how it turns out! What kind of wild mushrooms did you use? I have either porchini or chanterelles available at my local stores. I checked three different places, and I’m not sure which route to go! This is my first time making mushroom stuffing, but it sounds delightful! Thanks in advance! I’m a sucker for chanterelles, so I would go for those. I’ve used all kinds, though, and they all turn out great. This year I’ll be using the variety I got from Costco. I don’t even remember which kind were in there, but they were the most affordable. Oh yes!!! I forgot I saw some wild mushrooms at Costco!! I forget if they were fresh or frozen though. 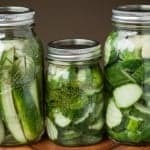 If fresh, should I use less chicken broth? About how much? I’m going today to get the rosemary bread, so hopefully they still have the mushrooms! My Costco didn’t have that Rosemary bread this year, but they did have a three-pack of Thanksgiving flavors but I believe they were cranberry. Instead I got a loaf of rosemary bread at Trader Joe’s. The dried wild mushrooms I got from costco were in a big container. At first they were outside the produce area but then they moved them to one of the aisles with the pickles. If you use fresh mushrooms, I would cut back on the broth a bit since they fresh mushrooms will release moisture. Hi, Krissy! I did see the mushrooms you talked about, but went with the dried Chantrelles instead! I’m so excited to try them as I never have before! I just have one last question, and I hope you are able to get back to me soon. Do you think this dish might be something I could put together tonight and bake tomorrow, or would you recommend waiting? Maybe even just putting the veggies and the bread in the baking dish tonight, then adding the broth and baking tomorrow? I’m trying to get as much done today as I can. My mother in law will be in our kitchen most of the day tomorrow. HI Marissa, So sorry I didn’t reply right away, I took a few days off for the holiday. I hope it worked for you! I actually made the entire stuffing the day before minus the baking part. I was really worried it would come out soggy. It ended up being almost soggy on the bottom and super crisp on the top… a combination that I actually LOVED. Please let me know how yours turned out! Hi Lisa, It was a typo in the recipe. I’m so sorry! Correcting it now. Hope it still turned out for you!